Foster meaningful cross-cultural connection & understanding. Promote and preserve local creative economies, both new & traditional. Create moments of heightened human connection. Support the sustainable economic development of local communities through responsible tourism. Tell inspiring, fair and representative stories through creative collaborations. The story behind Comuna begins with the relationship I have developed with my own dual cultural identity over the years as a Romanian-Canadian immigrant. In the mid 90's my parents were what we call today, economic migrants, leaving their lives, culture, and families behind for the unknown. They were forced to leave post-Communist Romania and immigrate to Canada with a 4.5 year old (me) and 9 year old (my sister) in tow seeking a better life, opportunity and secure future for their children. Ioana at her grandparent's home. Comuna Poiana Teiului, Romania, 1993. I was lucky to grow up as a Romanian-Canadian but also surrounded by many different cultures. My best friends were Punjabi, Hindu, Ukrainian, Yugoslavian... which also led me to witness from an early age how the media shapes global perceptions of people and places by hyper-focusing on select factors and in some cases complete fabrications. Ioana during a solo travel trip to Turkey. Istanbul, September 2015. In University I studied international relations, migration and sustainable economic development, where I was often drawn towards a focus on economic and cultural colonialism. Through this academic exposure to sustainable international development I quickly began to question our (western) representation of, and relationships with culturally rich but economically or politically challenged regions. As I have traveled throughout Eastern Europe, the Balkans, Turkey, the Caribbean, and Central America over the past decade, I have continuously witnessed a common thread sewn by mass-tourism. One where locals often feel forced to play into the stereotypes and false portrayal of their own culture rather than protect and share the authentic and deep-rooted realities, because that is where the money is being spent. I always thought I would end up working in international development, but after an internship in politics and 4 years of academic paper writing, I craved more creativity and started a creative brand consulting company. Travel wasn't always something that I thought about pursuing, but rather something that has always just played a big role in my life. Each experience has transformed and challenged me in different ways. At the same time, I have also been witness to others getting stuck on the same generic tourist routes while abroad with selfie sticks in tow more times than I can remember. Mass-tourism and simply flying in and out of a destination to be surrounded only by other tourists, seeing the same old attractions, and never digging deeper underneath the surface never sat well with me. Ioana's first trip to Cuba. Viñales Valley, March 2017. Connecting with local culture is something that I always seemed to take for granted while travelling, because it came naturally to me. I have often even found myself being an unofficial travel advisor to my social circle when they jet off to regions I have had recent experiences in. But on the walk back to our casa particular that night, I began to actively think about the meaning and purpose of tourism. How can responsible and intentional tourism lift communities, preserve their culture and traditions, and create new opportunities in places like Cuba? How can the barrier that often alienates the local experience further from the traveler experience be bridged? How can travel become a platform for creative exchange and collaboration to tell different and more representative stories of people and place? SO many questions began to flood my thoughts because of this conversation. The seeds for Comuna were planted over many years, memories, and experiences, but the overall vision for the company I have slowly and carefully been developing over the past year. A few months after that trip to Cuba, I quit my job at a design agency, rolled back my consulting contracts, travelled a second time to Cuba, fell even more in love with its people and culture, and launched a new travel brand. One focused on human connections. Comuna's overall mission is to foster cultural understanding through meaningful exchanges, to promote the local creatives and entrepreneurs pushing their countries into the future against all odds, and increase respect for traditional knowledge and identity. All while telling real stories through creative collaborations. So, how do we create these heightened travel experiences? I personally spend time on the ground to deeply scout our destinations and build relationships with inspiring locals who are striving towards making their countries and communities better. In collaboration with our local partners, we curate unique and highly immersive experiences that promote the good work and creative energy happening in each country we travel to. 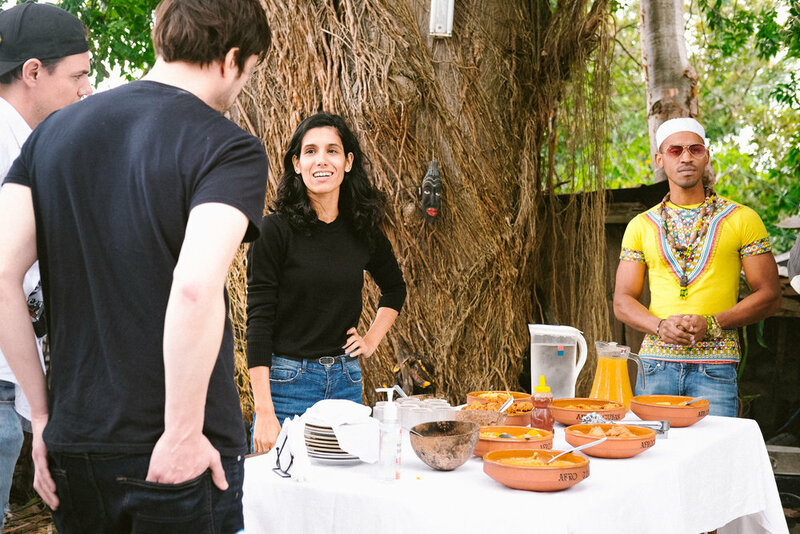 We work with everyone from passionate local guides to entrepreneurs, social activists, musicians, artists, designers and sustainable farmers to develop one-of-a-kind experiences for travellers that contribute to local development. Comuna becomes your personal, highly-connected, local plug into each destination we travel to. We want travellers to not have to spend hours researching the same repetitive travel recommendations just to get stuck in tourist traps. Instead, we want them to become immersed in a culture and live in the moment without having to worry about all of the details and logistics of making an inspiring trip happen. Right now, we are focusing on small group trips of max 6-8 people per journey. We keep it small so the experience remains intimate and flexible. We have big plans to expand as we grow though, and will begin offering the same highly curated and unique itineraries for private journeys in the near future, in addition to specialized creative cultural exchange retreats. In a world full of repetitive noise, increasing divisiveness and individualism, I wholly believe that there is no time more important than now to tell different, more inclusive and diverse stories of the people and places that we interact with wherever we find ourselves in this shared world. A group of young Cuban entrepreneurs we work with who are dedicated to sustainably building up the township of Guanabacoa in Cuba to tourism. January, 2018.